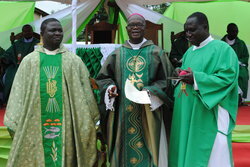 The occasion was planned to coincide with the pastoral visit of the Archbishop to the then quasi parish of St. John the Evangelist, Abrem Agona. 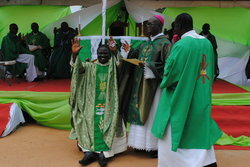 The Saturday before the inauguration day saw the faithful of that area giving the Archbishop rousing welcome with bras band procession through the principal streets of Abrem Agona. The Archbishop paid a curtsey call on the Chief Agona and formally informed him about his presence in the community. After a few exchanges of pleasantry, the entourage headed to the durbar ground where the Archbishop took some time to teach the faithful gathered. Basing his homily on the readings of the day, the Archbishop told the people to go into themselves and find out who Jesus was to them. He said that each and every Christian must answer the question Jesus put to his disciples as regards his identity. 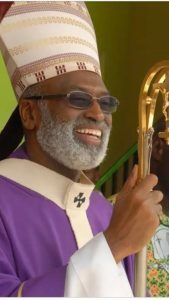 Archbishop Nketsiah urged the faithful not to allow anybody to deceive them about the identity of Jesus. He said, if they really discovered who Jesus is to them every day in their lives, they would experience marvelous change in their lives. He further urged them to work together to build the new parish and also support projects of the parish. The Catholic faith in Abrem Agona is said to have been sown by one Egya Asobrah from Ampanyi near Elmina in 1888. He, with his wife and three other friends began meeting in their home which caught the eye of Fr. Ernest Granier, the then parish priest of Elmina to visit Agona and to explore the possibility of missionary activity there in 1889. Currently, membership is about 250. On the inauguration day, the Archbishop confirmed 20 candidates. Among the dignitaries present were Hon. Atto-Arthur, (MP for KEEA), Sir Prof. Anthony Annan-Prah, the Marsallans, members of St . John International and a host of others.